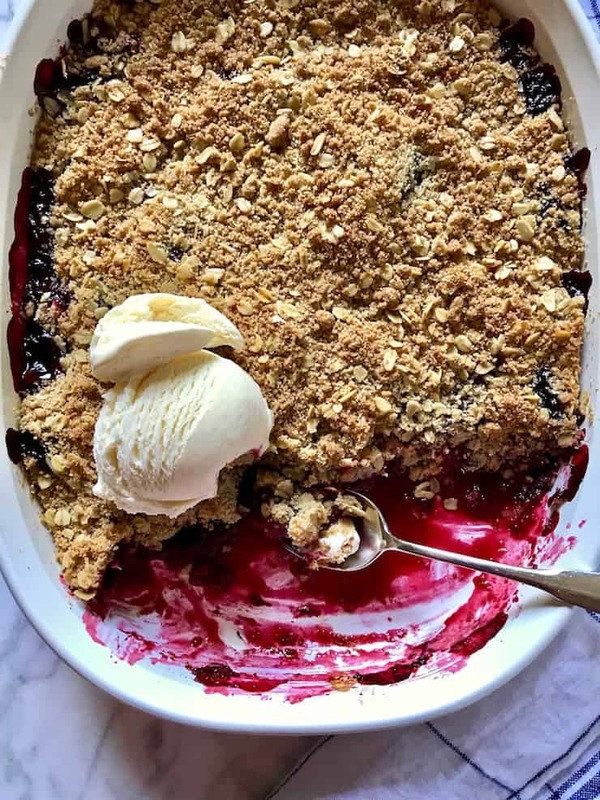 Fresh blackberry crisp made with just-picked blackberries from the farm ~ the best summer dessert, with a scoop of vanilla ice cream, of course! I absolutely love fresh berries in the summer and if they’re local, even better. Just so fresh and bursting with flavor. The farm near my house has blackberries you can pick, and boy oh boy, are they ever good! I’ve never seen such big, plump, juicy blackberries as these ~ just amazing. 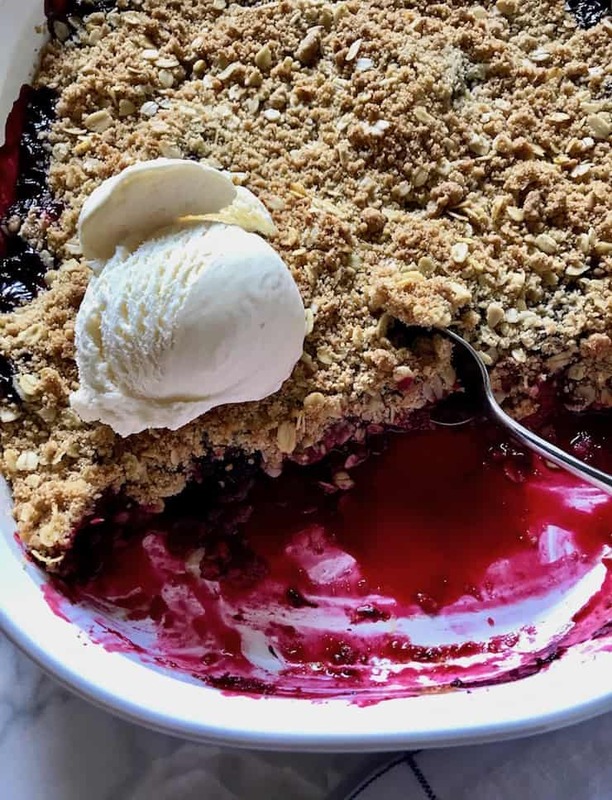 What’s the difference between blackberry crisp and blackberry cobbler? 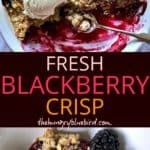 Last year, I made a blackberry-peach cobbler with these blackberries and this year I opted for a crisp. I love both cobblers and crisps, and am probably a little more fond of the crisp. The difference between the two? Cobblers have a biscuit-like topping and crisps have a streusel-like topping. So it’s really a matter of preference, which pastry do you want to cover the fresh fruit? I went for the crisp this year, because I was craving all that buttery, sweet crispiness. 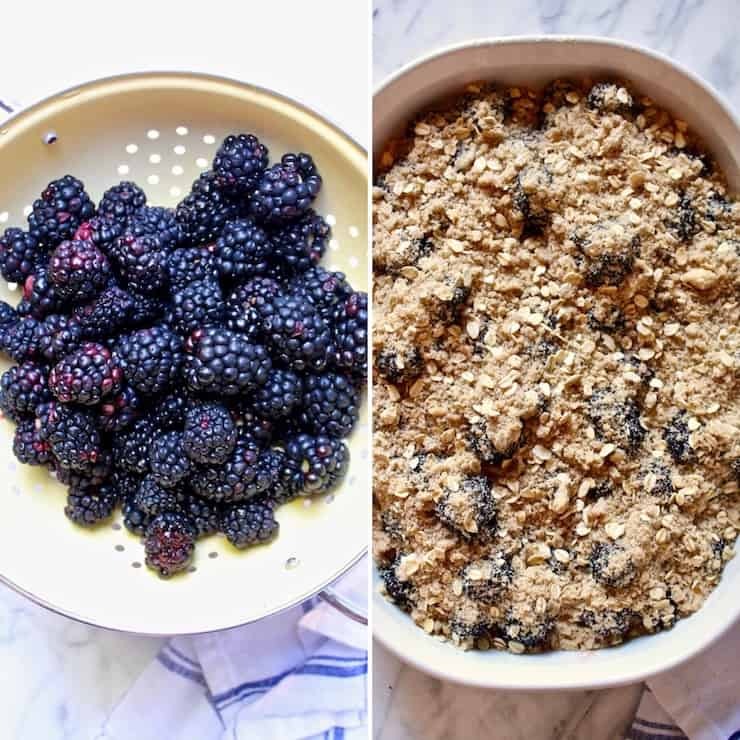 The blackberries are tossed with a little sugar, how much depends on how sweet the blackberries are. 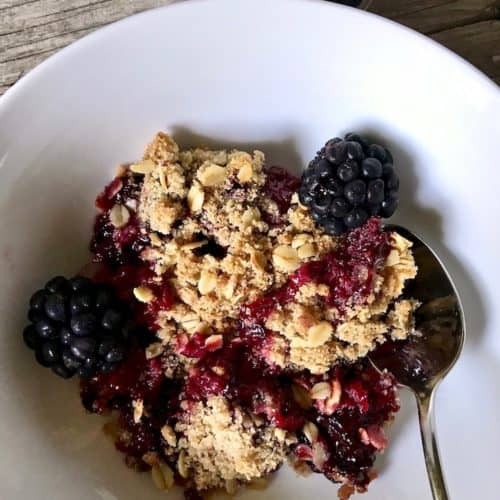 I used a couple tablespoons, but use more if your berries are really tart. I added a lemon juice-cornstarch slurry to help thicken it a little and some vanilla. That’s it for the berries, into a baking dish they go. I make a simple topping with flour, sugar, spices, rolled oats and butter. Just combine with your fingertips until you have coarse crumbles and that’s it. 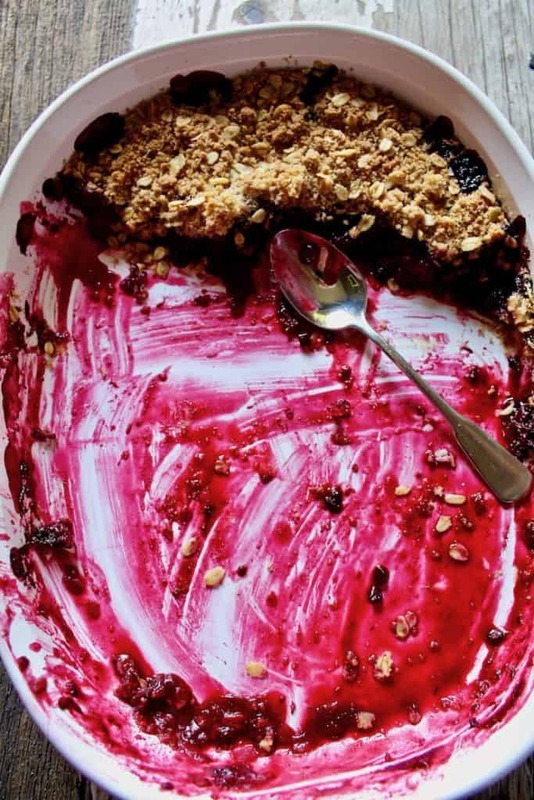 To keep it crisp when it cooks, cover the blackberries with just half the topping and bake. Then add the rest of the topping and finish baking. This helps ensure a crispy topping with not too much sogginess underneath from the berries. 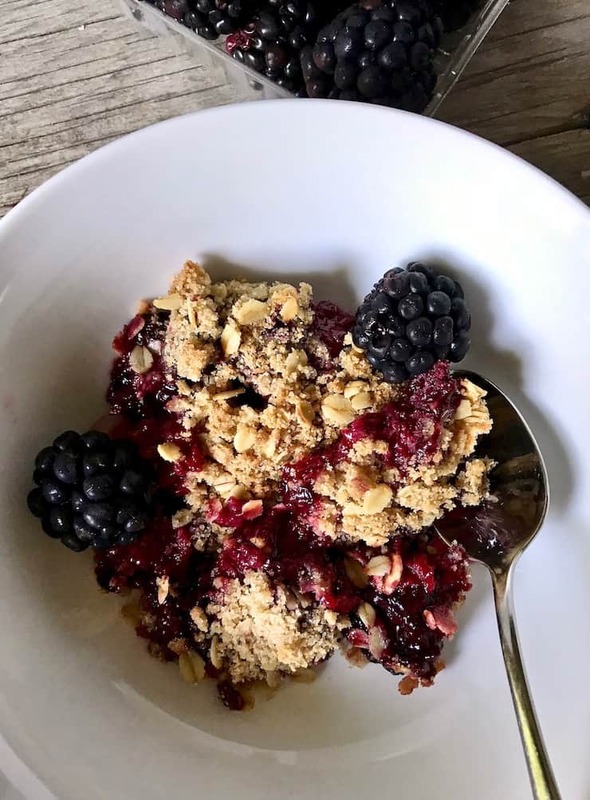 If you’ve tried this Fresh Blackberry Crisp or any other recipe on the blog, then don’t forget to rate the recipe and let me know how yours turned out in the comments below ~ I love hearing from you! You can also FOLLOW ME on FACEBOOK, TWITTER, INSTAGRAM and PINTEREST to see more of what I’m cooking in my kitchen and recipes. Make the topping. In medium bowl, combine flour, both sugars, salt, cinnamon and nutmeg. Add the butter pieces and with fingertips rub together until well blended and mixture resembles coarse crumbs (it will hold together if you pinch it). Add oats and toss to combine. Refrigerate until ready to use. Prepare fruit. Combine lemon juice and cornstarch in small dish until dissolved. 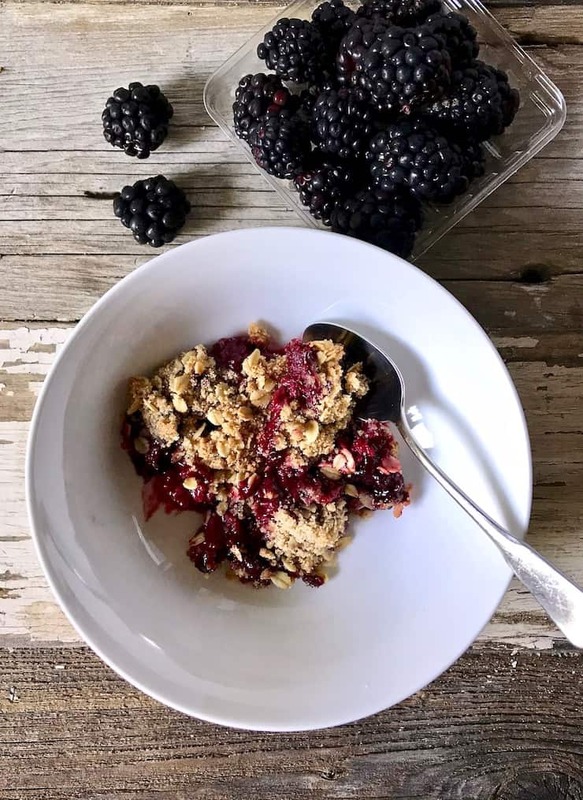 In bowl, gently toss blackberries with sugar, lemon-cornstarch slurry, lemon zest and vanilla. Pour fruit into a 9" X 13" or similar capacity baking dish. Top the fruit evenly with half of the topping (refrigerate other half) and bake for 20 minutes. Sprinkle with remaining topping and bake another 25 minutes, until lightly browned and bubbly. Let cool 20 to 30 minutes, serve warm with vanilla ice cream. Stunning!!! I took this to a dinner with Jim and Quinn (Jill). Guests stopped and savored at every bite. Glad you guys liked it! !